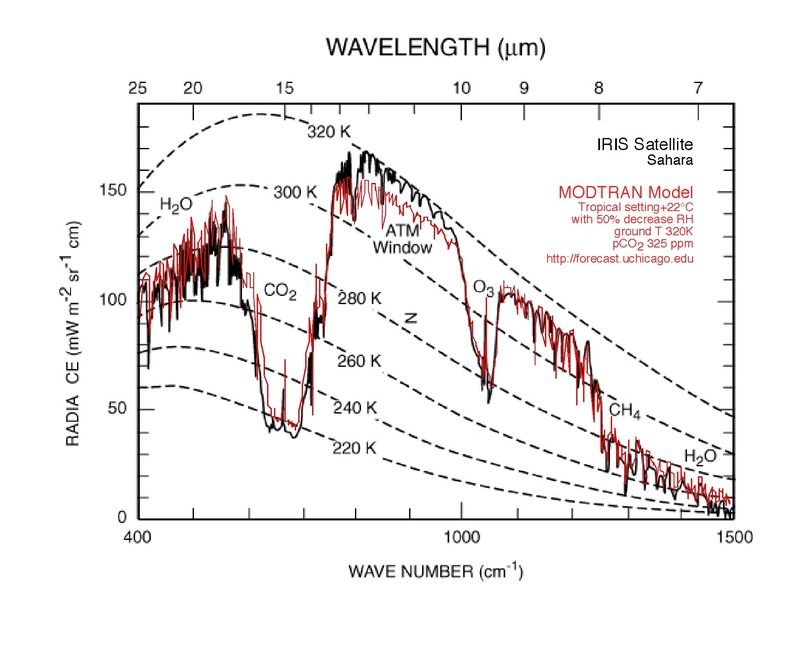 The MODTRAN model simulates the emission and absorption of infrared radiation in the atmosphere. The smooth curves are theoretical emission spectra of blackbodies at different temperatures. The jagged lines are spectra of infrared light at the top of the atmosphere looking down. The total energy flux from all IR light is labeled as Upward IR Heat Flux, in units of Watts / meter2. The model demonstrates the effect of wavelength-selective greenhouse gases on Earth's outgoing IR energy flux. MODTRAN results (red) compared with data (solid black) from the Nimbus 3 IRIS instrumentfrom Hanel et al., 1972). The RRTM model simulates the flow of electromagnetic radiation in and out of the Earth. The orange, red, and purple pairs of arrows on the right represent, respectively, the amount of shortwave radiation (incoming and reflected sunlight), longwave radiation (radiation given off by the ground and atmosphere), and total radiation averaged across the entire Earth's surface. 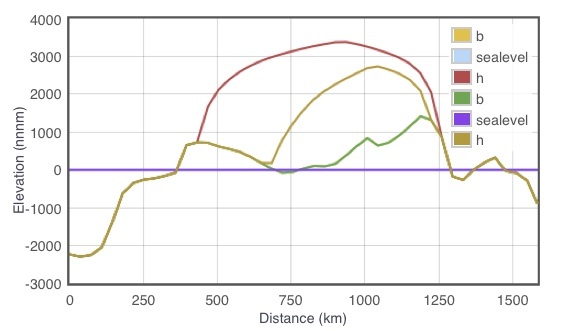 The arrows are graphed as a function of altitude, with the size of the arrow at a given altitude representing the amount of energy being carried per second in that direction per unit area. The size of the arrows is determined by the characteristics of the sun, surface, and atmosphere, which you can manipulate in the control panel on the left. The overall balance of this energy at the top of the atmosphere indicates whether the Earth is gaining energy (and likely warming as a result) or losing energy (and likely cooling). ISAM is an integrated assessment model, an interactive, parameterized model of the climate response to CO2 emissions and other climate forcings. This is the work of Atul Jain at the University of Illinois. Contrasting atmospheric CO2 concentrations and temperature between the High business-as-usual scenario and a ramp-down 80% decrease by 2050 scenario. The model runs interactively on your browser while you clobber it by dragging the global temperature up and down, or dosing it with CO2. You can "replay" the forcing history from one run, then drive another run, using a different model configuration, with the identical forcing history, for direct comparison. The red and biege curves show the elevation of the Greenland ice sheet after considerable CO2 forcing, for cases with and without Basal Sliding. The Soil T, Ice, and Methane Hydrate model simulates the flow of heat in a soil column. You can see the impact of the surface temperature, and transient changes in surface temperature, in order to simulate melting permafrost, methane release (potentially), and the use of transient temperature profiles as a diagnostic of past changes in surface temperatures (the borehole method). The HURRICANE model simulates the heat and energy dynamics of a tropical cyclone, known in the Atlantic as a hurricane. The model runs 20-day transient simulations and allows the results to animated again and again, looking at different quantities in the plots. The GEOCARB model is based on the Geocarb model for the geologic carbon cycle developed by Robert Berner at Yale. CO2 is released to the atmosphere as volcanic degassing, and consumed by chemical weathering of rocks on land. These dynamics generate a stabilizing negative feedback called the weathering CO2 feedback, which stabilizes atmospheric CO2, and hence Earth's climate, on times scales of hundreds of thousands of years. 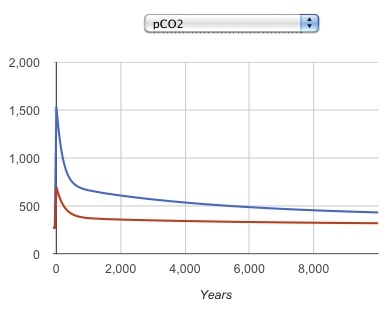 This derivative model adds to Berner's original the dynamics of ocean acidification and CaCO3 neutralization of a CO2 pulse, which should improve the simulation on time scales of decades to centuries. Model atmospheric pCO2 concentrations after 1,000 and 3,000 Gton C spikes, showing the "long tail" as the persistent increase in pCO2 after the spike. 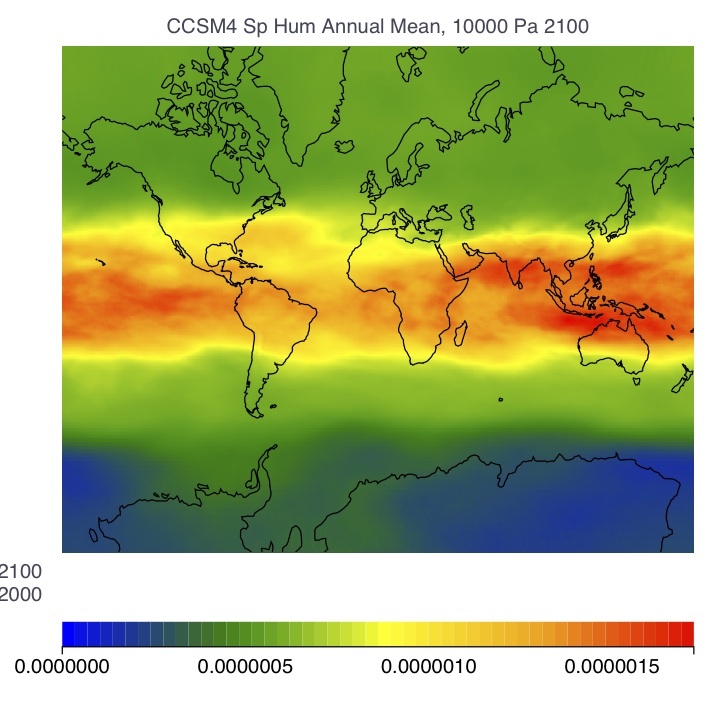 The METHANE model tracks the concentration of methane in the global atmosphere. The lifetime of methane in the atmosphere is about a decade (more or less, depending on how much is being released). The atmosphere itself mixes in about a year, so methane concentrations in the air rise and fall everywhere around the globe depending on the global rates of release to the atmosphere and decomposition. The model simulation goes in three stages. The first is a Natural stage, intended to roughly mimic the natural emission fluxes and atmospheric concentrations in a World Without Us. The second is an Anthropocene stage, where we are at present. The time evolution from natural to industrial is not intended to be realistic, because the real human impact did not switch on suddenly 50 years ago, but the model shows how the methane concentration relaxes toward the steady state in each time period. The third state adds the release of a user-determined Slug or spike of methane, to be released over a user-determined release timescale. If the release time scale is short, the result will be a spike and recovery of atmospheric methane concentration. If it is long, the concentration will reach a new plateau until the end of the slug release. The global sources (blue) and atmospheric decomposition sinks (red) of methane. The SLUGULATOR model simulates the responses to spike releases of greenhouse gases CO2 and methane. The radiative impacts of the two gases differ, with much stronger impact initially from the methane, per gigaton of carbon (Gton C) released. The difference is due to the different starting concentrations in the atmosphere. There is a lot more CO2 than methane in the air, so the absorbtion bands for CO2 are more saturated, and so the impact of another Gton C is less for CO2. The temperature evolution is controlled by two heat reservoirs: a shallow and a deep ocean. The shallow ocean equilibrates to the radiative forcing in about a decade, and it also exchanges heat with the deep ocean, which sets the pace for the temperature change of the Earth overall. The buildup of long-term "heat pollution" on the planet is simulated by the deep ocean temperature anomaly. One gigaton of each gas is released at year zero. The concentrations, radiative impacts, and temperature impacts of the atmosphere and the deep sea are all tracked through time. The idea behind HUBBERT'S PEAK is that the rate of oil extraction from a field tends to follow a Gaussian or "bell" curve. There is no intrinsic reason why it should be so, and political, economic, and technological changes can in principle change the curve. But Hubbert observed that it seemed to work in small fields that had been tapped out. Hubbert applied the method, in about 1956, to the time evolution of oil extraction from the continental U.S. (top option on the page). The other piece of information he needed was an estimate of the total amount of oil that would ever be extracted. With this, he predicted using the data up that time (1956) that the U.S. would reach peak oil production in the early 1970's. Alter the curve by changing the parameters, and see how much wiggle room Hubbert had to make this prediction. Today, with respect to World oil production, we are in a postion not unlike Hubbert's, where uncertainty in the total extractable inventory of oil have some impact on how well can pin down the year of global peak oil. The Hubbert curve applied to Whale oil. The KAYA IDENTITY is a simple formula to project future carbon emissions based on expected (or hoped-for) changes in Population, economic activity as GDP per capita, energy intensity as Watts per dollar, and the carbon intensity of the energy sources as CO2 per Watt. 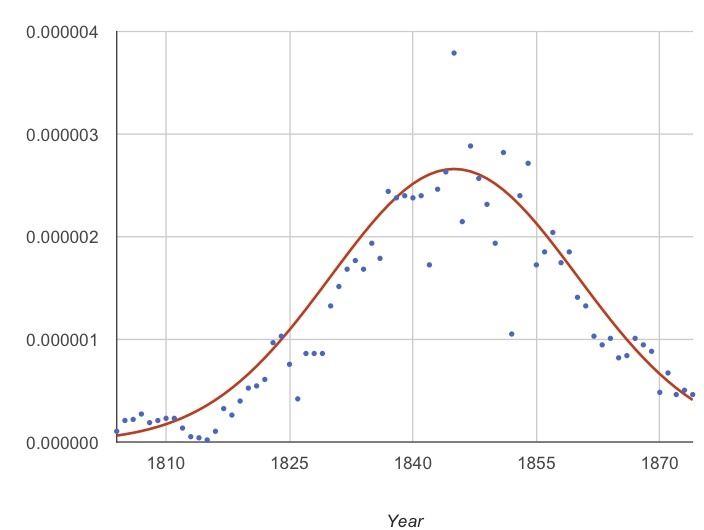 On the right, the GDP per capita as tuned to follow the past historical trend. 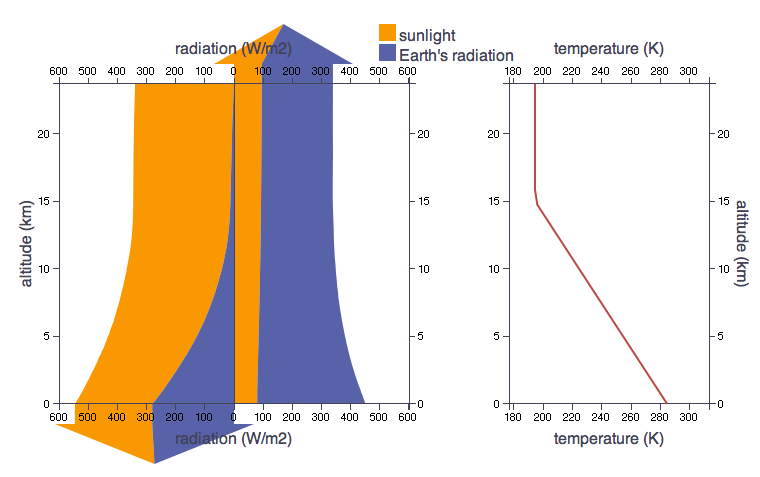 On the left, amounts of carbon-free energy needed, in teraWatts or 1012 Watts, in order to stabilize atmospheric CO2 at various levels between 750 and 350 ppm. GHCNM is a compilation of 7214 weather stations around the world from the NOAA National Climatic Data Center. AR5 Climate Models form the basis for the best estimates of climate impacts and sensitivities in the upcoming IPCC Fifth Assessment Report. The browser shows temperature trends from the weather stations, and allows you to compare them with the climate model predictions, extracted from their computational grids to correspond as closely as possible to the meterological stations. There are four different scenarios run for each of the models in the list. The Historical scenario is forced by the reconstructed evolution of radiative forcing since 1850, including natural changes (volcanic eruptions and changes in solar intensity), and human-caused changes (greenhouse gases and aerosols mostly). Another scenario, HistoricalNat, only includes the non-human climate forcings. There are also two scenarios for the future. The RCP2.6 scenario shows essentially the climate changes we have locked in so far, without further emissions of greenhouse gases. 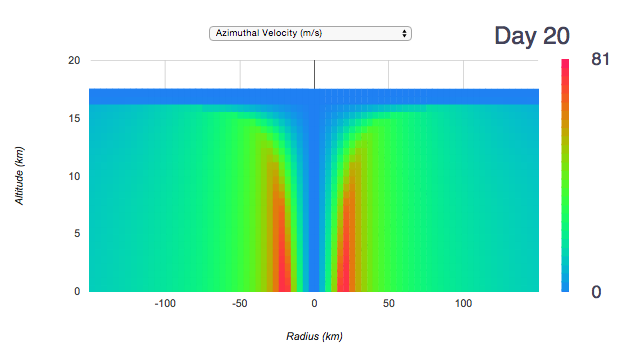 The value 2.6 is a maximum radiative forcing in Watts/m2. The RCP8.5 scenario is a high-emission scenario. Left A study in tundra. Small grey dots are met. station locations fitting the vegetation classification Tundra. 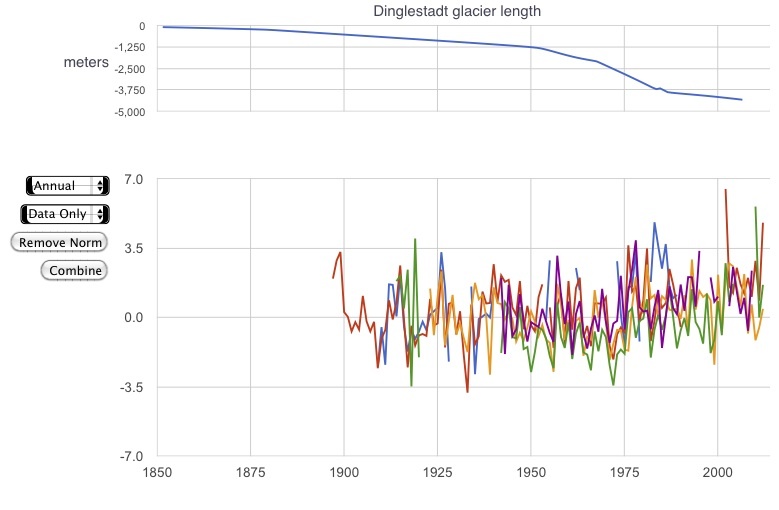 Blue dots are locations of glaciers; the large blue dot is the record shown in the upper time series plot is the Dinglestadt Glacier. 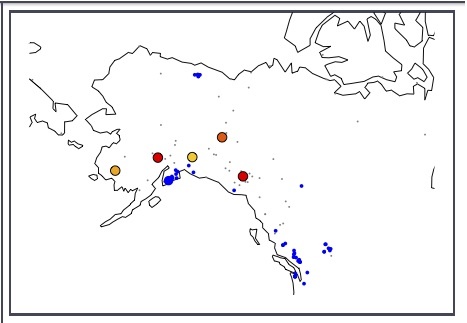 The large dots of other colors are selected stations from those on the map in the "tundra" vegetation bin. Right Temperature plots from the selected stations. AR5 Climate Models form the basis for the best estimates of climate impacts and sensitivities in the upcoming IPCC Fifth Assessment Report. This browser-based map making and data analysis system allows you to make and examine maps and even make movies of various properties from the a suite of different climate models from around the world. The model results available here are only a small subset of the AR5 model output archive. We have monthly mean values of just a few of the variables from two scenarios. 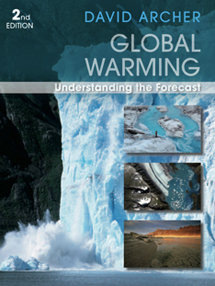 For years before 2006 the Historical climate forcing is used, which is a reconstruction of both the anthropogenic and the natural climate forcings. For years after this, the RCP8.5 scenario is taking to represent "business as usual". 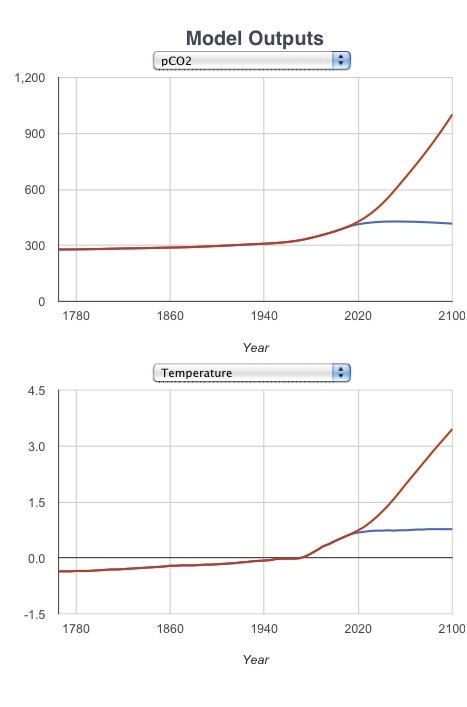 Temperature trends from these two scenarios can be compared with "Historical (Natural only)" forcing and a low-emission future scenario, "RCP2.6", in the Time Series Browser. Left, Precipitation From the CCSM4 model, February 2000 monthly average. 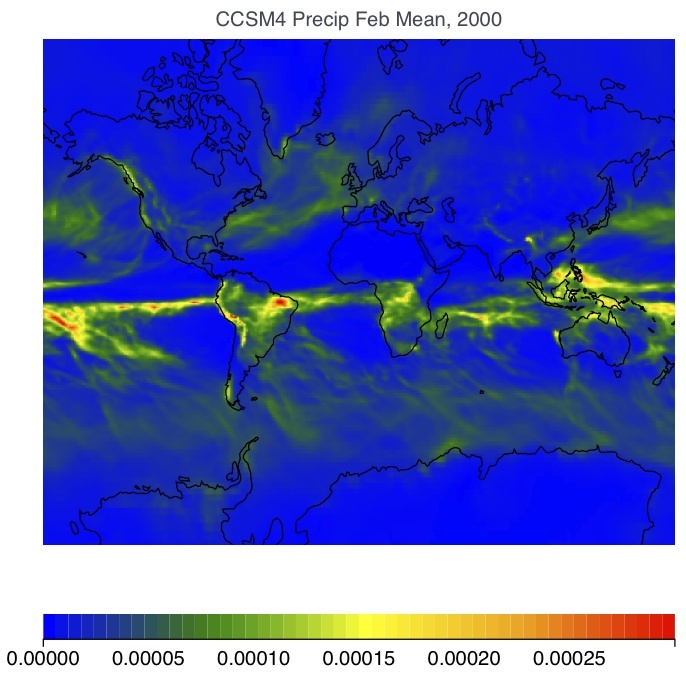 Right, change in specific humidity in the upper troposphere between 2000 and 2100 in the RCP8.5 scenario of CCSM4.